At least to the promoters of the “MR. GAY UNIVERSE” pageant. Can you imagine — likely to be confused with the existing trademark MR. UNIVERSE! Fabulous, not. Oh, who’s that on the right? 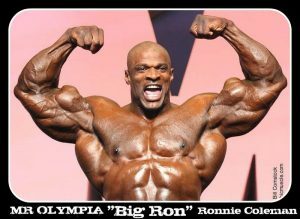 Mr. Universe (not gay) of 1994, Ron Coleman. Not to be confused with Big Ron Coleman, at left, the other Ron Coleman, who is entirely someone else altogether — he’s Mr. Olympia. Whole different thing, whole different Ron Coleman. Oh, and I am the other, other Ron Coleman. (There are other others, too.) I’ve been a member of the press, and I frequently appear before the bench (four members of it at a time this morning, in fact), but I haven’t bench-pressed much since college. Also not gay, generally speaking. Very chipper today, though. I worked out with you ast GOLD’s in N. tampa several years ago! Hello!